Today we are talking about some method. Where we can travel in time. ( If Our Technology can Use this method. We are talking about 7 theories which may make possible to travel in time. According to Quantum Mechanics Multiverse or Parallel Universe is Exist. In this theory, Always too many universes are becoming. And in these universes all possibilities. It means whatever you think this is possible in any universe. Which are that infinite possibilities? Its theory is like by scientists because they can solve the paradoxes. These paradoxes decrease the possibility of time travel. goto in his past and kill his unmarried grandfather(In past his grandfather isn't married yet). In this case, He destroys all the possibilities of his father born. Then how is born in present time? 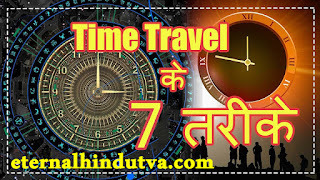 According to Multiverse theory, Time traveller go to past in another parallel universe. Even He killed his grandfather. Here isn't any effect in our universe. According to Albert Einstein, If you increase our speed nearly the speed of light. Then the speed of time is starting to decrease. If you are in any spaceship and travel with 99.999% of the speed of light. And Travel for one year. Then when you come in the earth. Then on the earth spend 223 years. Since if we want to travel in the past. Then we need to travel more speed than the speed of light. But According to Albert Einstein, the speed of light is constant, and nothing can travel faster than the speed of light. And if this is possible to travel faster than the speed of light, then we need infinite energy. Which isn't possible in now. And there is no machine which can produce endless energy. Another method of time travel is the Tipler Cylinder. According to the scientist in the middle of space and time. It is an infinite length tunnel. Which mass is 10 times more than the sun. According to American physicist Frank J. Tipler If we go to infinity length tunnel which is spinning very fast. Then we can travel in time both past and future. If there is any Tipler Cylinder and we go there and spin sometime. But when we come on the earth, we are in the past. because wormholes are tiny. Where only a small atom can be entered there. Black holes where the gravitational force is very high. Which Gravitational force can't across even light. Then its called black holes. Where the speed of time is very slow. If any spaceship rotates even far from black holes. Then in the spaceship time will be very slow. And when it returns in the earth. The time of the earth is the future for this spaceship. Because The near of black holes time is slower than the time of earth. Scientists found some mysterious cracks in the universe. These cracks probably became time the time the big bang. According to the scientist, these cracks are very dense. If they combine each other, then they might make the time loop. 14 March 2013 Scientists discovered the kinds of a particle. Which is called God Particle or Higgs Boson. According to scientists combine two god particle, time can be slow. But it is tiny and they need very high energy.